During a retreat you have the possibility to deeply give your attention to the essence for a few days. This opens up the opportunity to you, to perceive the healing experience of the self much deeper. This process is supported with Essential Healing. 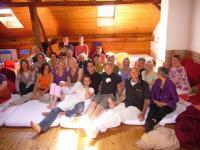 Retreats take place in specially choosen seminarhouses with wealthy food and nice atmosphere.